Trigg Life Mapper: Initial Impressions. Trigg kindly sent me one of their award winning Life Mappers to review on the blog. All the thoughts shared in this post are my own. The Trigg Life Mapper has been on my radar for a while. I had seen people posting about their planner on Instagram and the bold colour scheme really caught my attention. 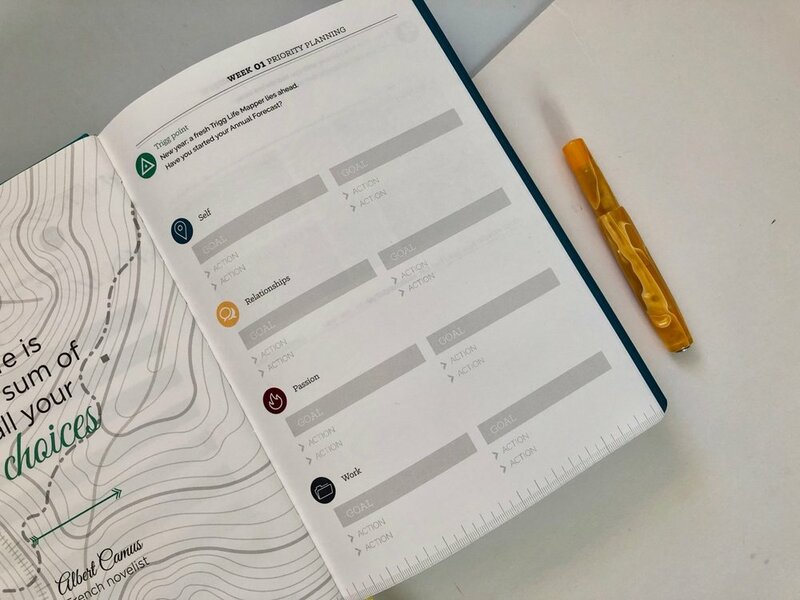 I have an interest in planners generally and I like to see what and how people use them. 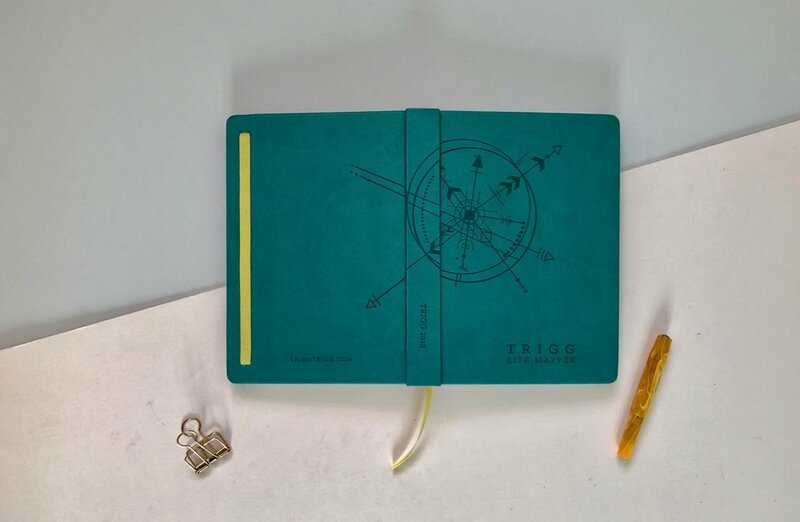 Trigg also won the Best New Product at the Stationery Show in London earlier on this year. So I didn’t come to this product cold, I already had some thoughts based on what I had seen. This is the time of year when people are looking for planners, researching, watching YouTube videos and trying to gather all the information they can to make the best decision for their annual planner. This review is lengthy and I have tried to cut it back but I felt like the information needed to be shared. Hopefully the headers will guide you through the review, but the plan is to discuss the layout of the Trigg Life Mapper and then give you my personal thoughts. Productivity Assistance in your planning. So part of the idea with the Trigg Life Mapper is to offer guidance with your goals for the year. There is a double page at the beginning where you can plan out your year and what you want to achieve. There is some guidance here, but it’s very generic and made me feel like I was filling in a job application. I hate being asked about my 5 year plan. It has the ability to make you feel inferior if you don’t have one, but also I don’t like planning out that far in advance, I feel like it sets you up to fail. This sort of start-of-the-year page is not uncommon by any means, but I feel that the questions being asked are dated. There is a Visual Assessment graph section to fill out. There are 4 focus areas outlined which are: Self, Relationships, Passions and Work. These focus areas are generic and in many ways inclusive to people who perhaps would be interested in a planner. However I come back to the feeling of being restricted by these outlines. The focus areas are too obvious and they don’t resonate at any depth. I do however like the idea of showing reflective or start-of-the-year information in a visual format. These appear at the start of the planner and you get two months per double page spread. The space per day is a little tight and there definitely isn’t enough room for my big handwriting or multiple appointments per day. Each month has a focus and colour theme which ties back to Self, Relationships, Passions and Work. The focus themes are loose associations to the months their given. So for January your focus is intentions which is an obvious choice for the beginning of a new year; February is relationships which I guess is down to Valentines Day and so on. These focus themes also don’t go any further, they just appear as words on your monthly calendar. This planner is littered with quotes and Trigg comments, and yet at a point when I would have thought some guidance would be necessary, it doesn’t appear. 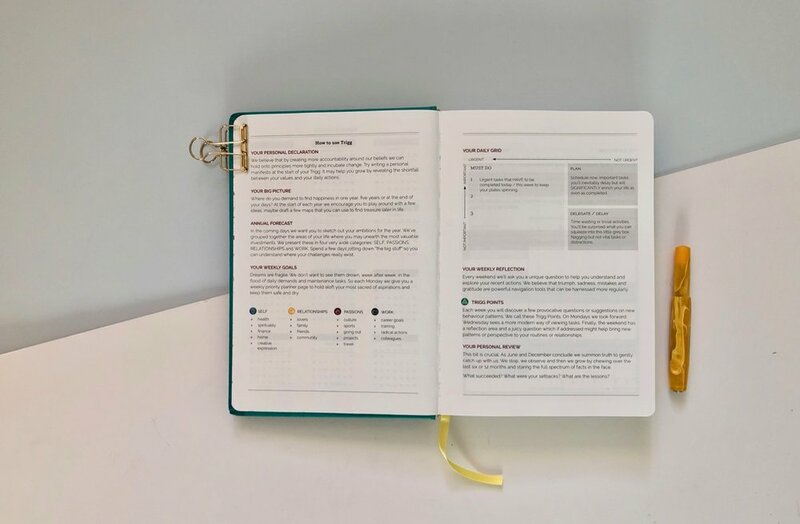 My first note is that the annual forecast pages appear after the monthly calendars splitting the meat of this planner, the monthly and daily pages. I think this section should have gone before the monthly section and keep all the themes and big thinking pages together. The aim of these pages again comes back to Self, Relationships, Passions and Work. You write down your goals for each theme. This is done as a list based on the layout of this page but there is no further prompts. No trigger phrases or questions to guide and push you in your thinking and planning process. The top third of each forecast page has a random assortment of descriptive words that could relate to the theme. Again I think this is for guidance and inspiration but I don’t really think they’re needed and they take up valuable space. There is a page which kicks off each week. Again the 4 themes come into play here and you write your goal to tackle that week and the actions to help you get there. I am not sure I have a goal for 52 weeks of the year on all 4 of these sections. That feels out of reach entirely. The weekly planning though is a good idea and one I like, but I don’t think this page is the right execution of that idea. There is no space for goals that sit outside of the 4 themes either which feels limiting. There is no space for general weekly tasks, such as calling the vet, arranging your car service etc. These don’t fit into the 4 themes but they’re typically things you need to jot down in your planner as general reminders. We then come to the real meat of this planner - the daily pages. There is a quote or a Trigg point that heads up each day. In the top half of the page there is a task, plan and delegation grid to help guide your day. Tasks gives you space for three must do items. There is a box named plan which I am little unsure how to use and then delegate / delay section. The delay / delegate section is interesting but I am not sure how to use this. I don’t think at the start of the day I would know what I want to delay, or whether this is a section that can be filled in at the end of the day and used for future reference? I think it’s an interesting addition to the daily spread but I really don’t know how to implement it. The second half of the page is for your appointments. I think the space allocated is too much. I don’t have appointments each day and most of my appointments are captured on my monthly spread. Obviously the headers can be ignored and general notes can be made here. One other small note, is that Saturday and Sunday don’t get the same layout as the weekdays. They share a page and have none of the daily page features. The weekend days always gets shafted when it comes to space in planners which leaves the weekend workers, or the side-hustle people without the space they need. 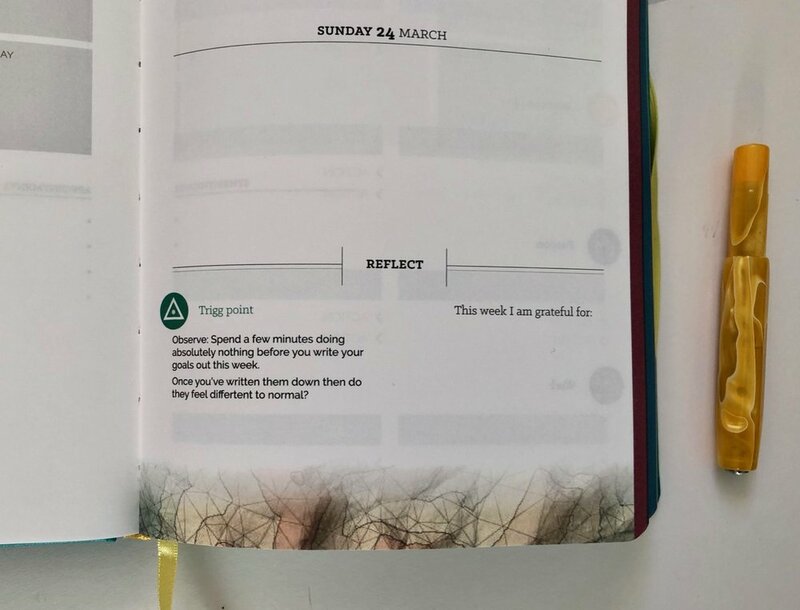 There is a small weekly reflective slot that is included on the weekend pages too, limiting the space even more. This prompts you to reflect on your week and write down something you’re grateful for. There is also the inclusion of some of the map artwork from Mapper theme that comes up on these pages. Everything on this last page feels too tight and squished. At the end of the planner there are some review pages for the year. There’s another Visual Assessment where you can rate yourself on your 4 pre-set themes. You’re then guided into a double page spread review by themes where you can note the successes and set backs for the year. There are also a few Notes pages at the back of the planner if you need them. I’ve alluded to my thoughts throughout the write up and have tried to not sound harsh but objective with this review. I realise that a planner cannot please or work for everyone but I think there is a lot which could have been improved upon in this planner. Firstly I was shocked when this planner arrived by how big it is. It’s a very bulky planner, which means it’ll be heavy to carry around and would be uncomfortable to write in with such a huge ledge. I appreciate this is a page a day planner, but there are alternatives out there that are a lot slimmer. The mapping theme is good for a planner and I can see why Trigg used this. The use of the mapping artwork doesn’t feel right throughout the planner however. 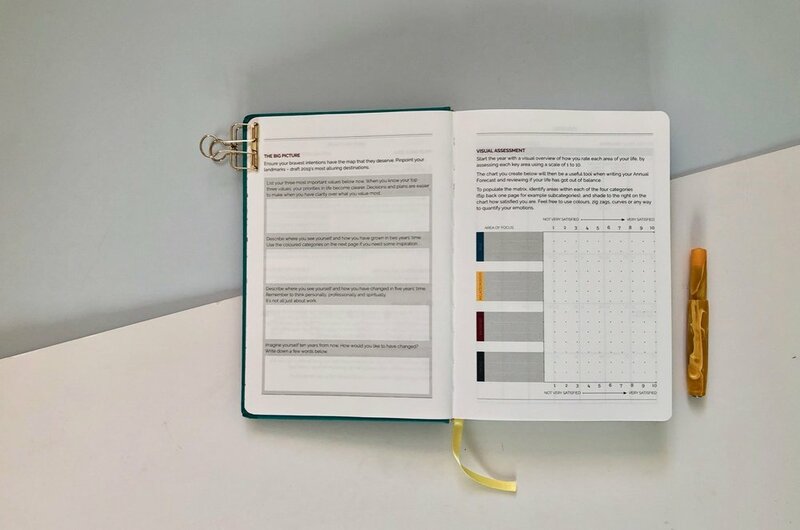 This is a really small thing, but subtler tones (even though grey is used a lot), better quality artwork and thought on the placement and use of the theme would have lifted this planner a lot. The thought behind the daily pages is a step in the right direction. It guides your day and tries to focus the attention on doing the important things. However in order to focus on the top 3 things for that day I need somewhere to dump the master list, and I think that is what’s missing. The monthly calendars and weekly planning pages don’t give me the space to do this because they’re trying to force me to focus on 4 themes I didn’t choose and potentially don’t care about. Rethinking the weekly planning pages would help a lot. Some guidance here is fine but I need to space to use these pages as I see fit. And this is likely to change over the course of a year too. 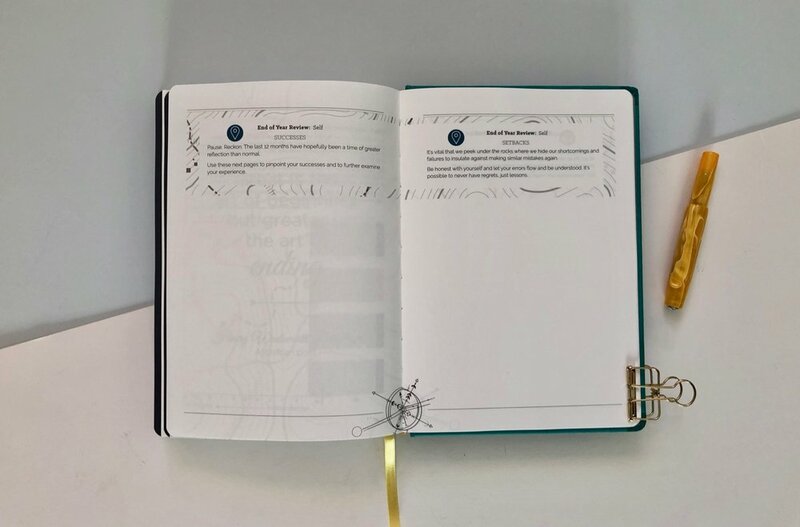 Moving the goals and aims piece into the monthly spread would also mean I can focus on more manageable goals in a more manageable period of time. 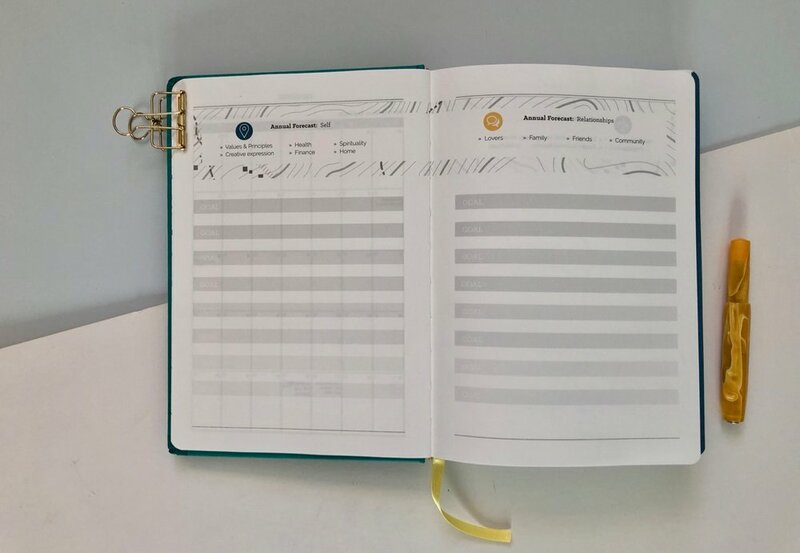 I think a productivity planner that isn’t aimed at a corporate person needs to be more than the obvious. Its needs to open up to creative professions, to the side-hustle people, to those who seek out the planners. It has to have a different mindset behind it to really help people be productive. At the moment I can’t see past the Trigg Life Mapper as some sort of HR self assessment form that I am forced to complete in order to get my bonus. It’s something I go through physical strain to do racking my brain for some nominal thing to include under a header I don’t believe in. I thought this planner was going to be something more than it was. In part I think I formed these preconceived ideas based on the awards it has won and the social media influences I have, but I can’t help but feel a little disappointed with the Trigg Life Mapper. I would like to thank the guys at Trigg for sending me their planner to review. The Big (Plus) Baron Fig Confidant Review. Over the years I have used numerous of Baron Fig paper products and they are a brand that I keep coming back to. My usage has been mainly around the Flagship, or A5-ish, sized Confidants or Vanguards, but recently I decided to give the large Plus sized Confidant a try. Unsurprisingly when I bought the Plus Confidant I didn’t have a specific use in mind. I felt like it could work during NaNoWriMo or for a larger scale planning project. But as its happened I’ve not used it for either of these things but taken the plunge and dedicated this as my journal. There is so much space. This is a much larger Confidant than the Flagship size, as you can see from the photos below. The yellow Confidant in the Flagship (A5ish) size and the charcoal in the Plus size. It’s a little unusual to get a hard bound notebook in this size, the only comparison I can think of is the A4 Leuchtturm1917 Master Slim. With the Baron Fig however you get full use of the page unlike the Leuchtturm1917 Master Slim, where there is a huge (and unnecessary) boarder on each page. I’ve found myself more focused using the Plus, like it’s more of an event to sit down to journal in the morning and evening. I jumped from the Field Notes Signature into this, so the change was quite drastic but I like it. Everything else is what you expect from a Confidant notebook. The hard bound cover is strong and I really like the texture of the cloth. It may not be water resistant or stain proof, but its really nice and tactile in hand. I have the charcoal version, my first, and I really like the dark colour with the bright yellow bookmark. There are 200(ish) pages in the Plus Confidant too which means there’s plenty of space for your master plans, brain dumps or general story-telling. The paper is friendly to almost any writing instrument, fountain pens and ink work nicely but these notebooks are also great with pencils. Like with all Confidants I really wish the bookmark was a tad longer. I really like the way these bookmarks look and wear, they fray quite a bit, but a bit of extra length would make them practical not just pretty. I’m not sure that will ever come though. I’ve ended up liking this size a lot more than I thought I would. It works great as a journal and I feel like I am writing more because there is a sense of freedom with the additional room. It may not be a travel friendly size and it does take up some valuable desk space but its a great notebook. It’s not often that the guys at Field Notes release a new addition to their standard product line-up but in the not so distant past they released the Signature Series. 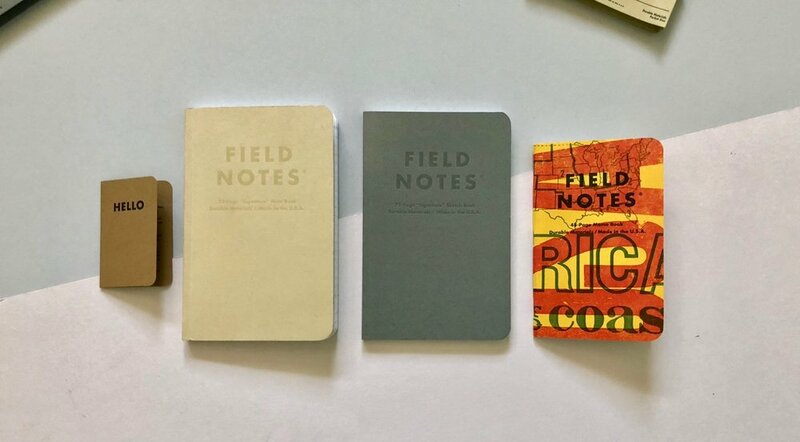 This came to the Field Notes flock due to huge demand after the success of their Dime limited edition. The Signature comes in a slightly larger size, 4 1/4” x 6 1/2” and with 72 rather than 48 pages. There are two different book options, one ruled (hurrah!) and the other is a sketchbook with plain paper. Both notebooks have a heavier paper stock, 70#T, which is again welcome as it really opens up the variety of writing tools you can use. 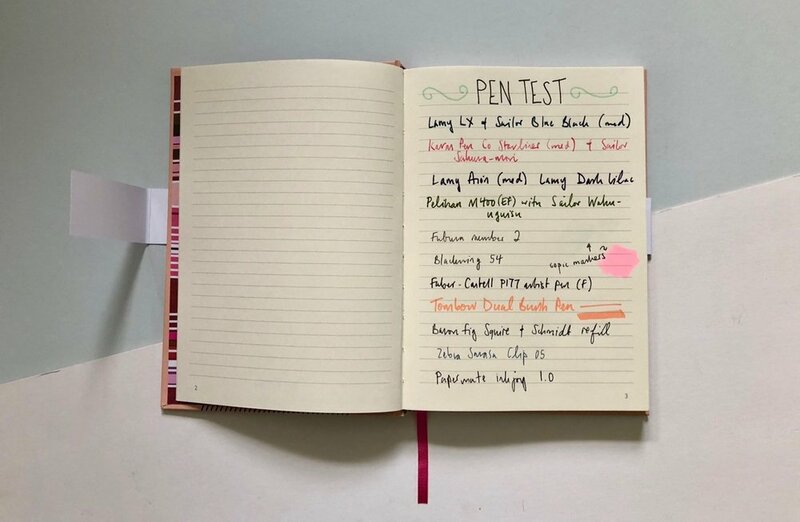 For some time the lack of a heavier paper stock from Field Notes has limited how and when I use their products, but the Signature has changed all that. I have been happily using fountain pens with no feathering or bleed through and testing out some of my coloured pencils in the sketchbook. The binding on the Signature gives this notebook its name. The three staples are ditched and a signature binding used which accommodates the size and additional pages. The binding also means the notebook lays almost flat which really is needed on these types of notebooks. On the spine the notebook particulars are debossed. 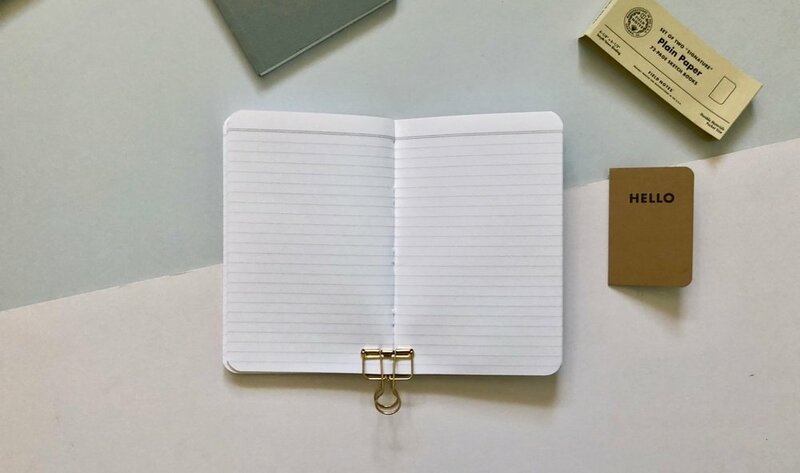 These small details really finish off this product nicely and set it apart from the pocket notebooks. A few of these lined up on a shelf would look sweet! Each version of the Signature has its own colour. 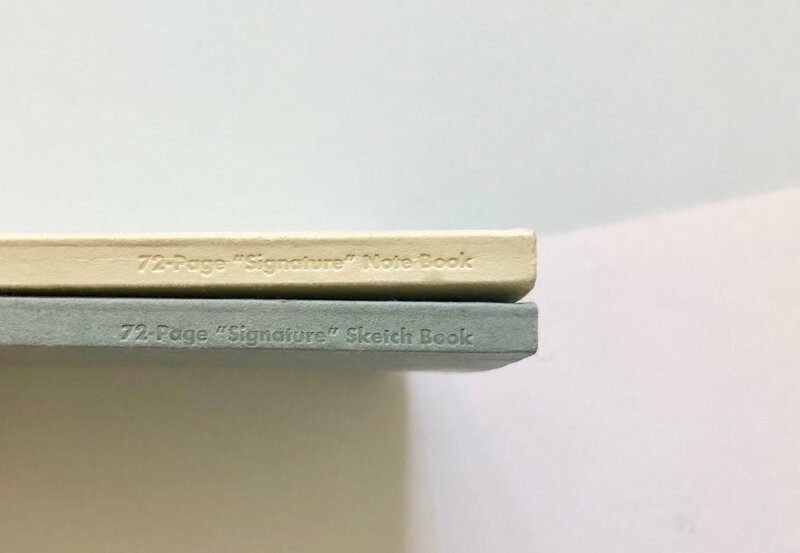 The sketchbook is a lovely blue-grey shade and the ruled notebook is a creamy colour. The branding is debossed giving it a really nice subtle finish. We have grown accustomed to good design from Field Notes. The Signature is very muted and simple but the little Field Notes Flourish (FNF) creeps in and I love it. For this notebook it comes with the logo which is delicious. You see this on the belly band and also debossed on the back of the notebook. It’s such a simple logo, it doesn’t have any new information on it, or anything specific to this notebook as such but I really like it. Thick lines! There’s a lot to like about the Signature notebooks and it’s a fab addition to the Field Notes line. I haven’t liked a new Field Notes notebook, limited editions included, as much as this one for some time. The muted colours are beautiful and will give this line longevity. The ruled and plain paper may not be to everyones favour but personally I love them. Grid paper is used so often in the pocket notebook sizes I think we are due to some alternatives and putting these into the larger size makes sense. The sketchbook couldn’t come at a better time for me in my sketching journey so I love this too. I’m going to stick my neck out and say these are my favourite Field Notes they have released and fit into my notebook usage perfectly.